一個高度奇幻的冒險被扭轉成 , [D.O.T.] 被設定成 特克賽爾 一個及需要有個冠軍產生的八位元宇宙, 在這個來自Mobage的刺激新型的RPG中 ,玩家將回經由手機遊戲被傳送到這個沒有戰爭或死亡概念的世界 - 由於這個世界已經被邪惡的機械人搞得四分五裂了 ,只有您的高明的領導能力能夠拯救 被分成三個部分的 特克賽爾 , 然後打開傳送門回到自己的世界. A high-fantasy adventure with a twist, “D.O.T.” is set in Texel, an 8-bit universe in dire need of a champion. In this exciting new RPG from Mobage, the player is transported through a mobile game into a world that has no concept of death or war–and is being torn apart by sinister robotic invaders. Only your skills as a commander can save the three tribes of Texel, and open the portal back to your own reality. ★ An epic mashup of robots and dragons set in a distant universe! 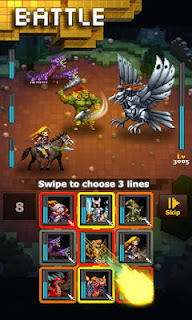 ★Choose battle formations with a unique swipe action! The defense of Texel begins now!